Every few years you hear wine growers, viticulturists and winemakers mention that it has been a difficult season. Albeit only in certain regions or affected areas, there are always those few cases who have a more difficult harvest – or need to prepare tenfold to avert disaster. Be it hail, drought, mildew or “kalander” – not everyone has the opportunity to “crush it” every season. 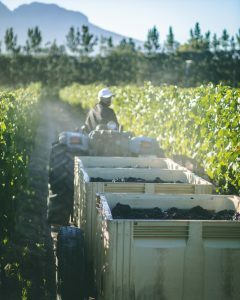 So, with most of the Western Cape caught in one of the worst droughts that it’s seen in decades, there is no surprise that the first round of grapes for MCC has seen some BIG (and some less significant) fluctuations. It felt like mere seconds – going from cleaning floors and prepping tanks, to working in shifts and everyone pushing to get as much done as possible within a day’s work. accept any challenge. The amount of teamwork required from every individual on the floor, or in the vineyard, needs to be unwavering. The amount of trust and reliability needed to form this intricate web of high-functionality is awe-inspiring. And it is with this attitude of positivity and excitement for the challenges that may lie ahead – that we embark on another harvest season.